I was very surprised and excited to hear that my book, The Ghost Bride, has been nominated for the CILIP Carnegie Medal and Goodreads Choice Awards for Best Debut and Best Fantasy. I happened to be in Singapore for the Singapore Writers Festival, and heard the news just as I was about to head off in search of something to eat. “What? !” I said. The Carnegie Medal is one of Britain’s oldest and most prestigious children’s book awards, the UK equivalent to the Newbery Medal. The Goodreads Readers’ Choice Awards are an amazing reader endorsement. I took a look at the other titles on these lists. Wonderful books written by talented and famous authors. Wow! I don’t know what happened to the universe, but to be named alongside them is really quite unbelievable to me. To recover from the shock, I rushed out to eat a plate of nasi lemak, which is rice cooked in coconut milk and accompanied by things like hard boiled eggs, roasted peanuts, and spicy sambal. The classic accompaniment is chicken curry, but it’s terrific with fried chicken. Fried local chicken is a smaller bird than what you see in America, and is far more tasty, with delicate little wings and drumsticks to nibble on. In fact, the local KFC is a good stop if you’re in Malaysia or Singapore and want to do some “scientific comparisons”. Singapore is not the kind of place you should visit if you are on a diet. There is too much good food – every shopping center is judged by its anchor restaurants and food eateries. While I was there, I had about 4-6 mini-meals a day. Things like curry laksa, prawn mee, sup kambing, all washed down with copious amounts of ice Milo and fresh coconut water. Feelings of guilt were averted by carefully avoiding a weighing scale. Steamed Sri Lankan crab for the purist – each claw was about the size of my hand. 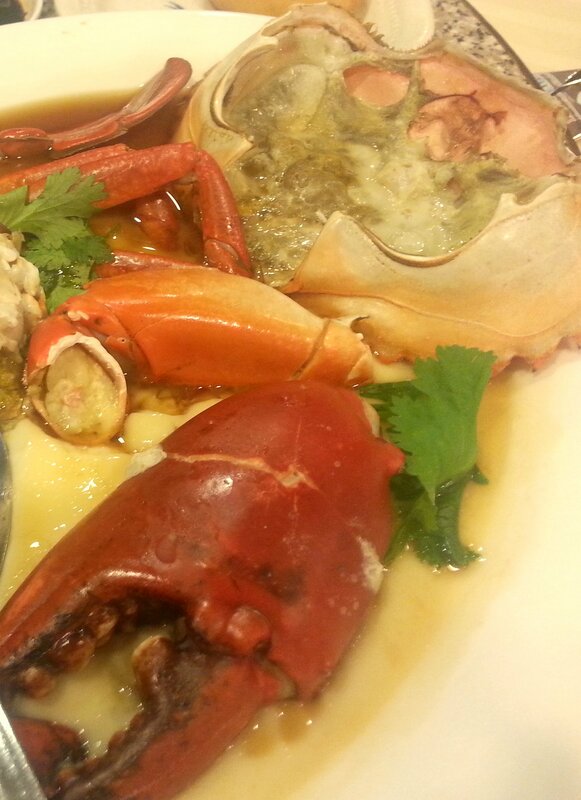 Singapore is also the place to eat one of the best crustaceans in the world – the mangrove crab. This muddy delicacy is found in the warm waters of SE Asia, but the finest and largest specimens come from Sri Lanka. 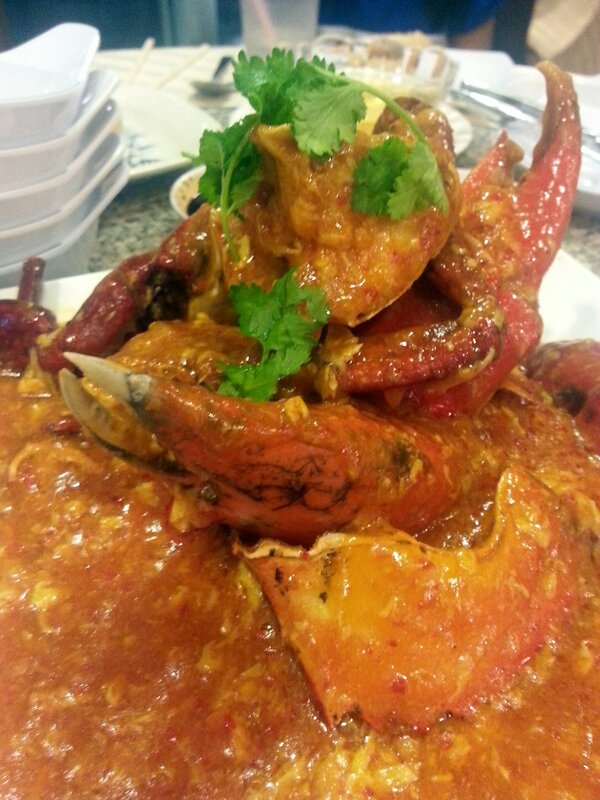 I went with my sister and her family to eat both steamed and chili crabs at Long Beach Restaurant. She explained that although the rest of the food was “ok”, the real draw was the quality of crabs, thanks to their crab buyer (or whatever arrangement they have with sourcing). And she was right, as the crabs we ate that night were bursting with meat, obviously just taken before their shells molted. Chili crab looks like a Japanese horror movie but tastes fantastic. In the meantime, I am so thrilled and deeply grateful to be nominated for these book awards. I never imagined that something like this could happen (the Carnegie Medal nomination is for the UK Young Adult version of my book). The Goodreads Choice Awards are chosen by readers, so please stop by and vote – there are so many wonderful books! Congratulations on both nominations!!! That is so exciting! And I love this post on food too! One of the many reasons I loved The Ghost Bride was the mention of laksa. Yum! Well done Yangsze, this is really good news. I had seen the Goodreads entry but not the other. I must eat Singapore food soon! also congrats. congratulations on the nominations for Ghost Bride – so happy for you and so great – love your blog but hungry after reading!! Congratulations, even though I have not read your book yet. Your gastronomic interest is equally aesthetic with good culinary display. I recently read your book this summer and thought it was fantastic. It’s been a long time since I read a book that sucked me in so completely and then left me going, “I need to go back into that world again!” Very happy to hear about your well-deserved nominations, congratulations! And those crabs look beyond delicious! Congratulations on the nominations. I just got done voting for The Ghost Bride on Goodreads. The Ghost Bride is the first book I picked up after a few years hiatus and I simply love it. By the way, I was born, bred, and still living in Klebang (Kecil), Malacca. 🙂 But not in a mansion like the Lims though. As for the mansions, most unfortunately were already long abandoned. I had the pleasure of visiting one in which a Nyonya restaurant was run but the business folded and the mansion since forsaken. Recently however, I notice some revival works. Perhaps they’re being turned into “homestays” or boutique hotels which are now popular in tourism-intensive Malacca. Yeah, Klebang’s considered out-of-the-way until recent years. The restaurant might have survived if the timing was right. Then again there is one, Bert’s Garden, which has been around and thriving for many years. Congratulations!!! I really enjoyed “The Ghost Bride” and voted for it at Good Reader.com!! Congratulations, Yangsze! Happy to hear your good news! So exciting! And those meals (minus the chicken…I’m a veggie) sound amazing! The Ghost Bride’s been nominated for the CILIP Carnegie Medal and Goodreads Choice Awards. Bravo! Hi there. I just finished reading The Ghost Bride and I think you deserved the nomination! Hope to read more of your book in future. All the best! I just finished reading your book… You make me really want to dream about Er Lang! And really glad that Li Lan chose him despite uncertainty future. Any sequel? Love your book and hope u will write a sequel to it!! I’m a Malaysian and proud of the book depicting malacca as my mother is from malacca and my family live in Muar!! All the best to u in your next book!! Thank you so much! I’m so happy that you enjoyed it – it means a lot to me, especially coming from a fellow Malaysian. Muar also has a lot of interesting history 🙂 Happy Chinese new year! I just finished The Ghost Bride a few hours ago, and I loved it! Thank you for exploring such a rich and rarely touched territory– ghost marriage is fascinating! Your description of the spirit world was beautiful and unsettling. Reading the Plains of the Dead into the night felt like time stopped around me and the ghost world was probably imperceptibly circling my reading corner. Also, I was excited by the vocabulary; words like ‘eldritch’ and ‘gauche’ and ‘penurious’ (I looked them up, and they aren’t even in my thesaurus under eerie, crude, and stingy, respectively) and I loved the Malay words that helped preserve the authenticity of the world. How long from its conception did it take you to write? Thank you so much for your kind words. I’m delighted that you enjoyed it – and super happy that you liked the vocabulary! I think you must be one of the first people to comment on it. Many of the books that I read or scrounged up during my childhood were old Victorian or Edwardian era novels, which probably accounts for it. 😉 As for writing, it took about three years to write this book – one of which was a fallow year when I simply got stumped (also not helped by small children barging in at all times of the day). I’m working on another book right now, and hopefully it will go a bit faster! I love it when you can express a lot with a single word… I wonder if one of those childhood books was the Count of Monte Cristo because you used ‘paroxysms’ (good word!) and that word is mentioned repeatedly in CMC. If you would indulge, how did you manage your way out of the slump? Yang-sze, very pleased to hear you are working on another book! Hahaha I was one of the ones who voted for you during the Goodreads Choice Awards. Most delayed I am, seeing that most of these post were from 2013. I loved your book ,”The Ghost Bride”. I would of loved to read more of Er Lang! Are you thinking of writing a sequel? Congratulations on your Goodreads nomination! I just finished reading your book. My mother left it for me on her last visit to CA from Michigan even though I insisted that I would never have time to ever read for pleasure again being a high school English teacher. My colleague told me that if I had time to watch Netflix on my days off, I could certainly allow myself the guiltless permission to put down the student essays and pick up a good book. Your novel gave me the escape that my stressful employment has needed. Thank you for sharing your work with my mother and me by publishing.